Neighbourhoods with tree canopy shade of 30 per cent or more can be up to 13 C cooler on a hot summer day. File photo. The ACT needs to plant 7000 trees a year for the next decade just to restore Canberra’s urban forest to its former state so it can protect Canberrans against climate change driven heat waves, according to the Greens. And an ANU scientist says a failure to act could see whole streetscapes dying. But while the Government acknowledges the benefits of the urban forest to mitigate the effects of climate change and is endeavouring to plant more trees, its numbers fall well short of what the Greens are calling for. 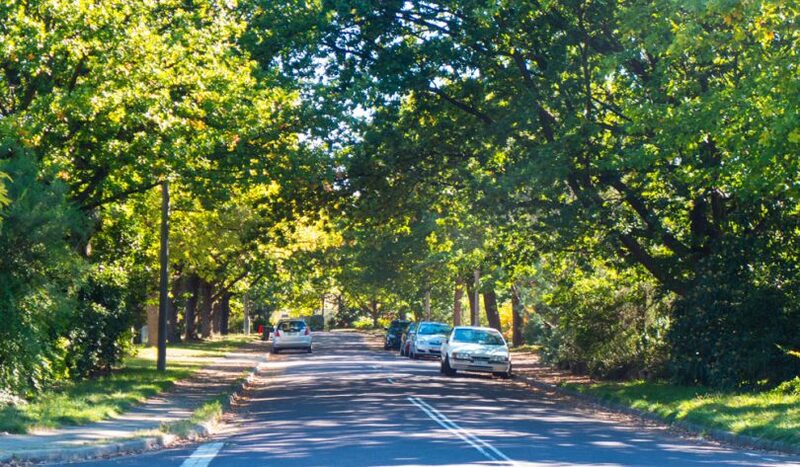 Greens Planning spokesperson Caroline Le Couteur says street and park trees in the ACT’s established suburbs are declining by around 3000 a year, according to an answer to a Question on Notice put to City Services Minister Chris Steel. “This is a time of climate emergency. The climate is warming — summers are getting hotter — and heatwaves are happening more often, and are hotter, for longer,” she said. Ms Le Couteur said that a recent report on the urban heat island effect in Canberra found that neighbourhoods with tree canopy shade of 30 per cent or more can be up to 13 C cooler on a hot summer day. “If we are going to have a livable Canberra we need more trees,” she said. Associate Professor Cris Brack from the Fenner School of Environment and Society at the Australian National University has authored several papers on Canberra’s urban forest and conducted research for the ACT Government, only recently delivering a list of recommended species. He has been calling on the Government for years to get on the front foot and act before the city ends up with whole streets of dying trees, saying many areas had trees near the end of their lives and required urgent attention. While this included the inner south and north, Belconnen’s predominate eucalypts were also feeling their age and susceptible to mass die-off in a heat wave. Dr Brack believes planting 7000 trees a year, only about 1 per cent of the 700,000 strong estate, is doable, but Treasury had, for over two decades, consistently knocked back budget bids from the old TAMS, now City Services, for adequate planting and replacement programs. “They know what needs to be done they just can’t get the funds to do it,” he said. Ms Le Couteur said planting 7000 trees a year would, over a decade, restore the tree canopy, but there needed to be changes to the planning rules so space was preserved in and around developments for plantings. Land to house plot ratios needed to revert to 60:40 so dwellings were not so big, and there was room for trees to be planted. In some of the newer areas, plot ratios were well over 50 per cent, leaving little room for vegetation around the block perimeter or for the back yard. “Older suburbs are losing their tree canopies as bigger houses replace modest older homes on bigger blocks. Elsewhere, newer suburbs are being built without room for deep-rooted shade trees,” Ms Le Couteur said. Dr Brack echoed this concern saying some of the newer area’s streetscapes and blocks were not big enough to support trees. Mr Steel said the Government completed a winter tree planting program of 608 trees across Canberra, with an additional 96 planted in spring from November 2018. He said planning was under way to increase the rate of replanting to cover not only the tree losses due to ageing but to also increase the overall tree canopy coverage across the city. “The ACT Government committed to plant 1330 trees in the 2018-19 Budget. A total of 444 trees will be planted in the first stage with plans for a significant number more over the next three years,” he said. He said the Government was considering how best to renew the ageing urban forest and increase canopy cover to mitigate the impacts of climate change as part of its new Climate Change Strategy to be released early in 2019. Any hints on where to locate this “list of recommended species” delivered by Cris Brack? All the trees in tuggeranong’s main strip were cut down. Must make it easier to do the roadworks. Somewhat mature trees but hardly what you would call end of life. I always laugh when the old ‘its Treasury’s fault’ is rolled out. No government agency makes decisions – politicians do…. Too right Jim. They can find plenty of money for follies so they need to get off their A’s and do something about replacing the city’s aging canopy. Maybe get their developer mates to chip in a bit more, because many of the mature trees are being cut down in the name of urban renewal. The pollies and the bureaucrats also need to think a bit more about trees suitable for the Canberra climate, possibly based on the living experiment that is the various new and old arboreta around Canberra.